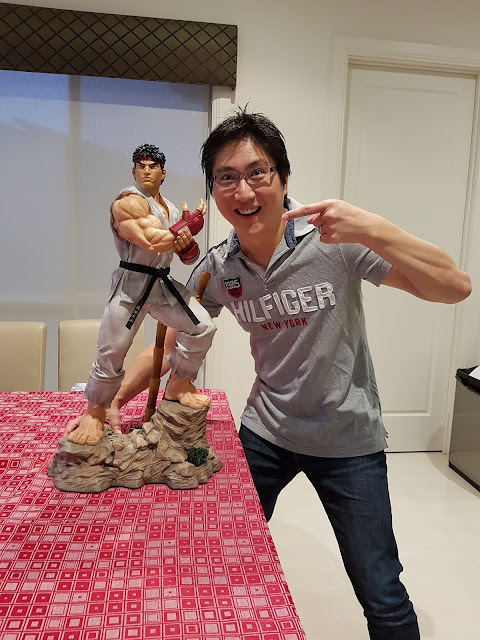 For those that follow the page and channel, you'll know that I love Street Fighter, and have played Ryu for over 25 years! 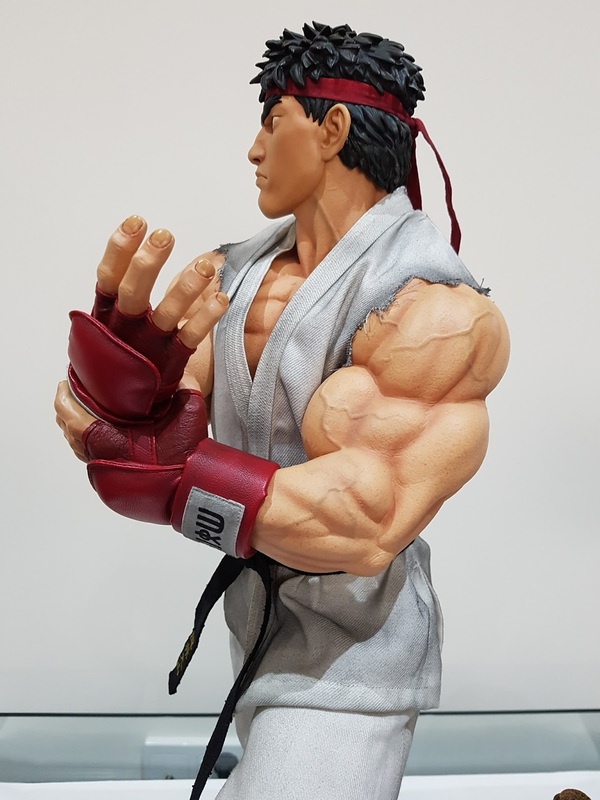 When PCS announced that they were releasing a 1/3 scale Ryu in his classic gi, there was no way I was going to pass on it! Straight out of the box, and the sheer size of the thing really hits you. 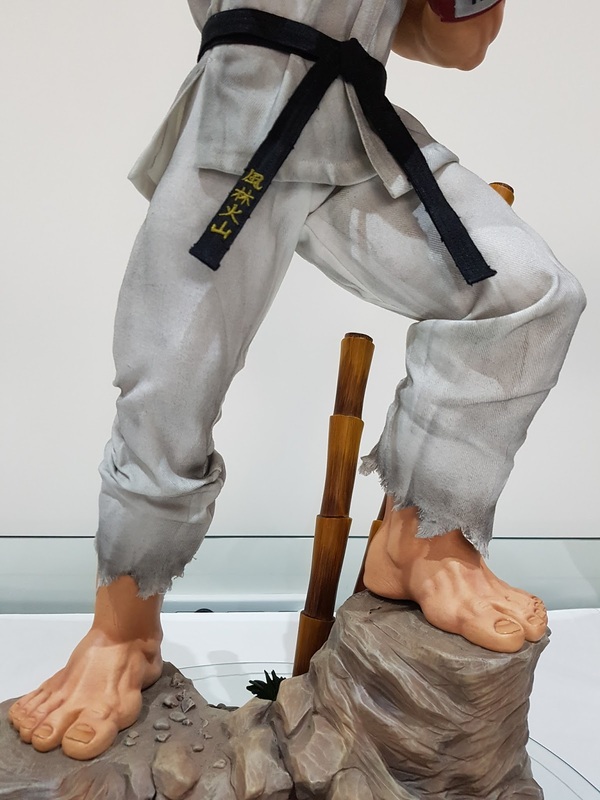 This is my first 1/3 scale statue, and I totally get why so many collectors love large scaled statues. The presence the statue commands is well deserved - even my wife was impressed! It wasn't too hard getting the feet into the base, but just be careful how you handle it because it is pretty heavy! The statue simply looks amazing from any angle. It will take a bit of fine adjustment to get the head sculpt sitting nice and flush against the neck. Just move the neck line of the gi out of the way and gently move the head in the slot, and it should sit without showing a gap. 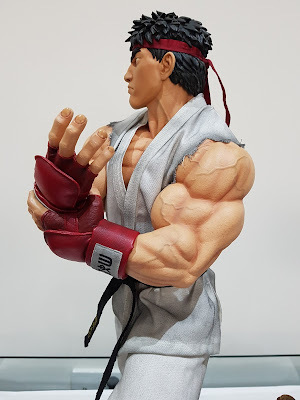 After complaints of the weird yellow colouring of the 1/4 scale Ryu, PCS wisely went with the standard grey weathered look. It's a much better stye that's more in keeping with the game and how people remember the character. The gi is the usual nice cotton type material, but just play around with it to make it look as natural as you can. The skin texture is a standout, and is a must at this scale. The paint app is awesome, with lots of fine freckling to add realism, subtle blue in the veins, and shadow detailing to really accentuate the musculature. The head sculpt has a smoother surface on the face, but the paint app matches the body well with the same nice freckling and texture. The gi can be taken off by undoing the velcro on the sides. Do not try to untie the belt, but just undo the velcro and pull out the gi. 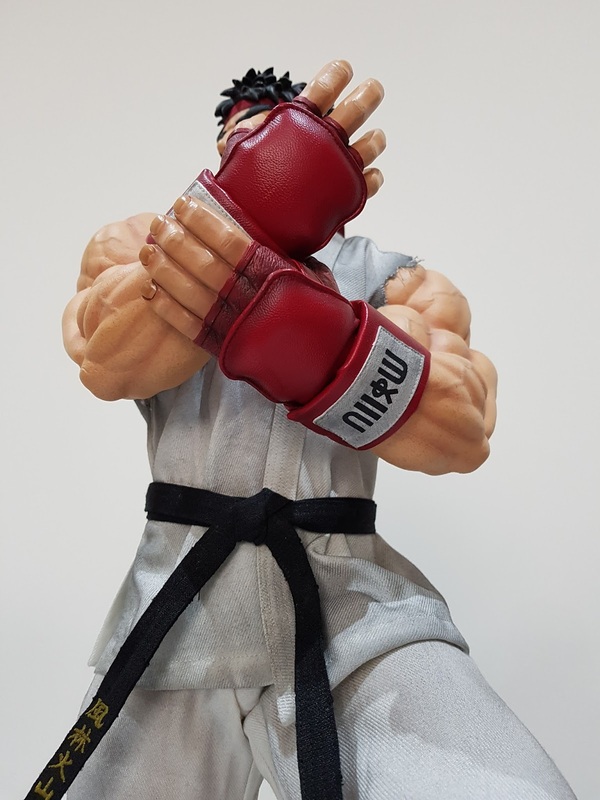 You can then tuck it back through the belt and have the gi folded over it. This reveals the full extent of the naked torso, and the amazing effort they did on the back sculpt. The muscles and paint app are superb. 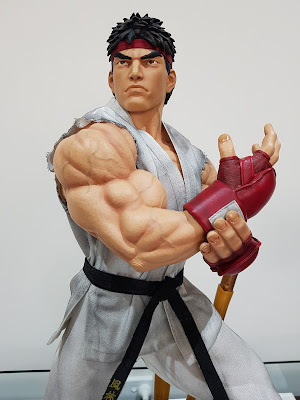 But I love my Ryu in his classic look, so I put the gi back to its original style. It was a pain to put everything back and adjust it nicely with the velcro. But once all set it looks great. I love the added detail in the padded hand gloves. 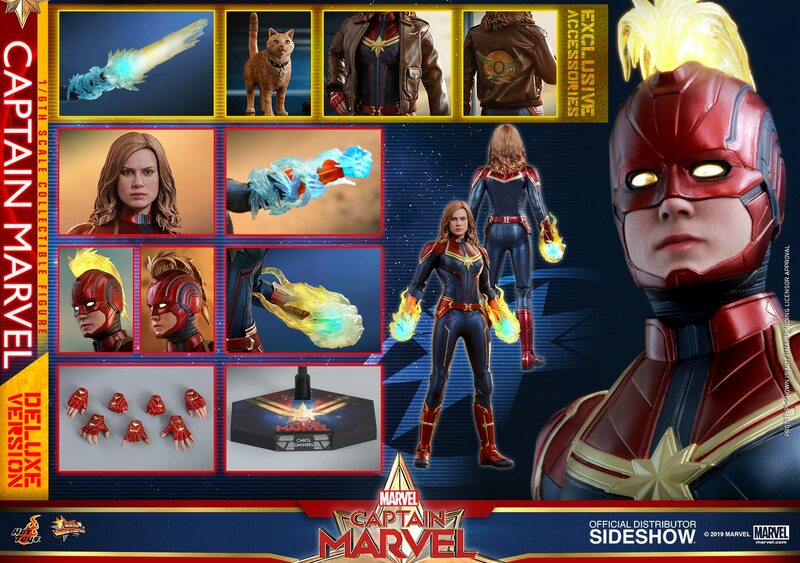 I thought they were fully sculpted, but they actually have a leather type material on the outer glove that is padded. It adds a lot to the realism and style of the piece. The feet are nicely done, with no issues on mine with the toenails. The feet are the classic over-sized style for which Ryu is renowned. The base is nicely sculpted and painted too. I love the bamboo piece at the rear, which is actually longer than what they showed in the original prototype. The added length is a much better look. 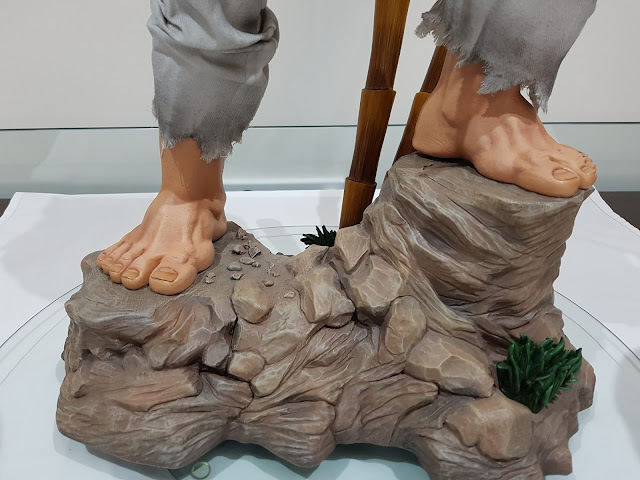 The base also inclues a small swap out piece at the front, where you can alternate between a full rock look, or have that small section of grass. I like the grass as it adds a splash of colour to an otherwise pretty plan brown rock surface. 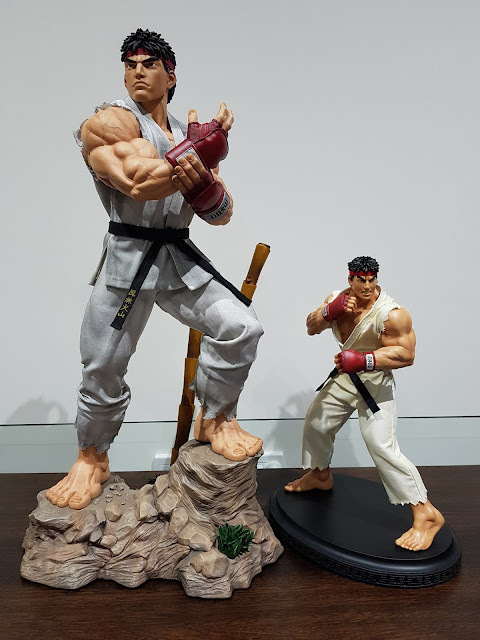 My first PCS statue was the 1/4 scale Ryu Ansatsuken exlusive, and that thing just looks tiny next to the 1/3 scale Ryu. 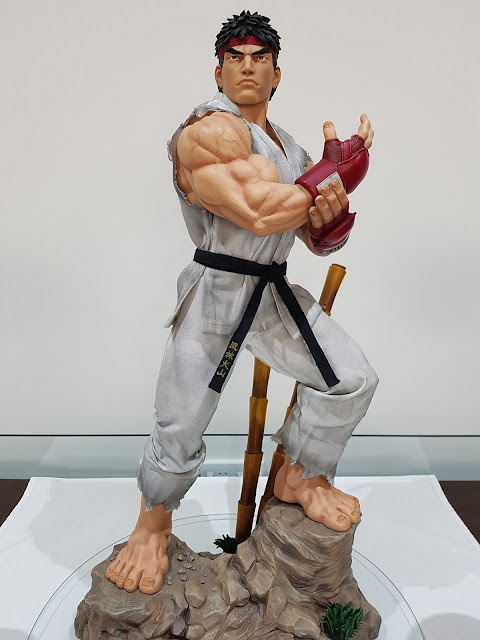 I'm definitely happy to have both in my Street Fighter collection. 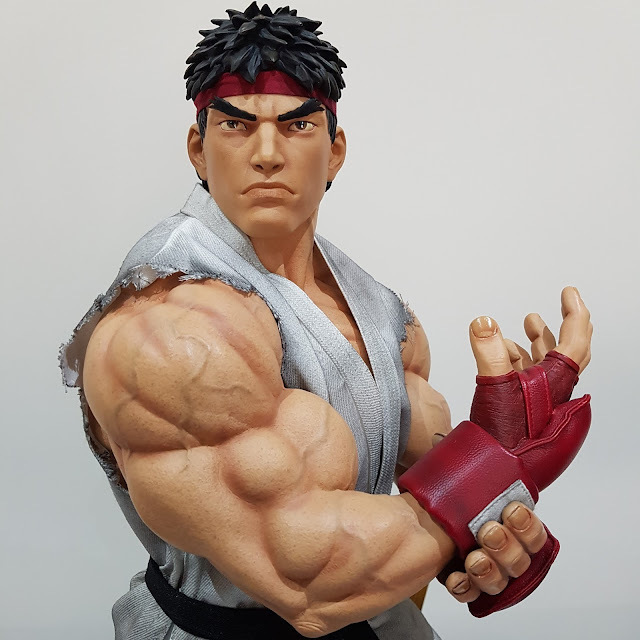 I have the 1/3 scale Chun-Li and Sagat preordered, and cannot wait to check them out when they're released. I'm sure they'll be worth the wait just like this Ryu was! This will be a permanent addition to my collection, and will take pride of place as a centerpiece in the display room. I'll definitely need to get a custom acrylic case made for it! Simply amazing work by PCS, and highly recommended for any Street Fighter fan!